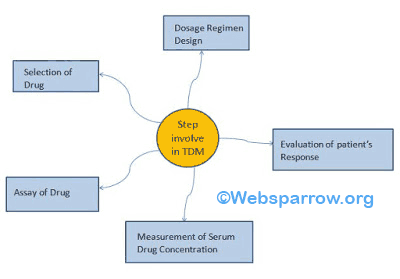 This article will help you to understand the overview, aim, and usages of Therapeutic Drug Monitoring (TDM). Therapeutic Drug Monitoring is the application of pharmacology, pharmacokinetic consultation, pathology and clinical medicine in the interpretation of measured drug concentration in body fluid. Therapeutic Drug Monitoring is a branch of clinical chemistry and clinical pharmacology that specializes in the measurement of medication concentrations in blood. Therapeutic Drug Monitoring refers to the measurement of drug concentration in a biological fluid with the purpose of optimizing a patient’s drug therapy. The aim of Therapeutic Drug Monitoring is optimizing drug therapy by knowing the measured concentration and therapeutic effect and using this information is the case of the patient. Suspect toxicity due to drug metabolite. A sub-therapeutic response to drug therapy. Assessment of drug therapy where the patient is clinically unstable. Assessment of potential drug interaction. For minimizing the risk of serious drug toxicity and assessment of the appropriateness of dosing for the drug used as prophylactic therapy. To identify the drug on substance, this may be contributing to the presentation of the medical emergency. To avoid drug toxicity and maintain the concentration of drug within a therapeutic range. To assist dose adjustment in various disease states where individual variation in drug absorption, distribution, metabolism, excretion (ADME) may be important. To minimize the time period needed for dosage adjustment (depending n half-life off drug). To identify the poison and asses the severity of poisoning on an emergency basis in a poisoned patient. These following steps involved in TDM. Drug-selected on the basis of therapeutic consideration, therapeutic equivalency or cost and pharmacokinetic consideration. Patient-specific information is also considered like- medical history, allergies, drug sensitivity, etc. If the patient is not responding to the drug regimen, dosage regimen should be reviewed for adequacy, accuracy and patient compliance. The blood sampling is done in the case when a patient is not responding as expected. Blood sampling time is taken during the post distributive phase for loading and maintenance doses. The blood sample is taken once steady state drug concentration has been achieved. Assay of the drug is completed with the help of HPLC, Gas Chromatography, Spectrophotometer, Fluorometry and Immunoassay, and radioisotope methods.